Soho tailor John Pearse is currently clearing out hundreds of lovely hand-made slim silk ties in dozens of different designs. 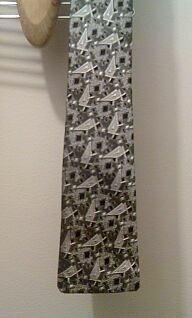 I have a few of John's ties myself (such as the one pictured) and they are amongst my favourites. They are lovely looking, very narrow and just as importantly they tie extremely well. The ties have been reduced to £30 each or three for £60 - bargain! Some of these designs are very limited with only one or two left, so get down there now to check them out. And don't forget to say Jean-Paul sent you!